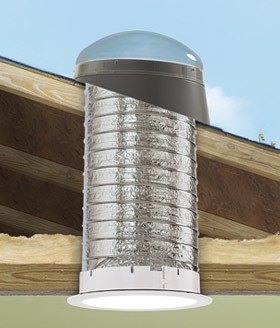 The Model TMR is a rigid VELUX Sun Tunnel Skylight® that is perfect for installations which require longer tunnel length and installations facing all exposures. Available in 10" and 14" diameters. The Sun Tunnel Skylight emits passive light from the sun without the heat emitted by electrical light sources. The TMR rigid Sun Tunnel Skylight features a highly reflective tunnel that provides brighter, whiter light output in any application. This makes the Model TMR great for most applications, even those with long tunnel runs or those in areas with less sunlight. The TMR features an innovative one-piece pitched metal flashing that is designed to keep out the elements while providing the optimal angle for gathering light from all directions. The TMR comes with a pre-assembled ceiling ring and paintable ceiling trim ring to complete any look. The standard Model TMR Sun Tunnel is designed for low profile roofing materials such as shingles and shakes. Tile flashing is also available. The TMR Sun Tunnel installs on roofs with slopes between 15° (3:12) and 60° (20:12). 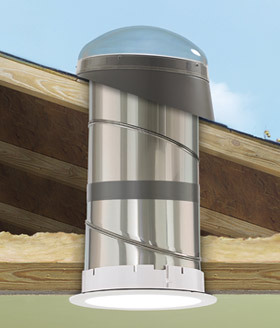 The Model TMF is a flexible VELUX Sun Tunnel Skylight® that can be installed quickly around attic obstructions, making it the easiest tubular product to install in the industry. The Sun Tunnel Skylight emitts passive light from the sun without the heat emitted by electrical light sources. The TMF flexible Sun Tunnel Skylight features a ring with a mirror finish just below the dome to reflect light from all angles. The flexible design of the tunnel makes the Model TMF the easiest tubular product to bend around attic obstructions and great for sunny areas. The TMF features an innovative one-piece pitched metal flashing that is designed to keep out the elements while providing the optimal angle for gathering light from all directions. The TMF comes with a pre-assembled ceiling ring and paintable ceiling trim ring to complete any look. The standard Model TMF Sun Tunnel is designed for low profile roofing materials such as shingles and shakes. Tile flashing is also available. The TMF Sun Tunnel skylight installs on roofs with slopes between 15° (3:12) and 60° (20:12).